Thomas Wolfe famously observed that “you can’t go home again.” His saying seeks to convey the wistful notion that things that you once enjoyed, years ago, can never be fully recaptured and will never have the same magic again. That may well be true — in the abstract. But I’m guessing old Tom wasn’t a 24 fan. If he was, he would have agreed that you should at least try to go home again — in the sense of giving a shot to a new series that seeks to recapture the most over-the-top, terrorist-frenzied, mole-addled, conspiracy within a conspiracy within a conspiracy TV show ever broadcast. So tomorrow we’ll be having a beer at a local tavern, peering at the cast of characters and trying to decide who is most likely to get knocked off in the first episode, which airs immediately after the Super Bowl. Will it be a security guard? An innocent bystander? A hardass CTI agent who just happens to be in the wrong place at the wrong time? Who cares? We say: let the bloodbath begin! Will 24 Live Another Season? 24 Live Another Day wrapped up Monday night. It was a pretty good season in my view — I also happily ended up tied for first in our 24 Death Pool at work — and now the question is whether Jack Bauer will be back for another season. (Spoiler alert!) The writers and producers of 24 have a love-hate relationship with Jack Bauer. They love to let him kill bad guys, but they put him through hell. Over the years, Jack has lost countless family members, friends, romantic interests, and supporters to death or estrangement. At one point in the finale, Chloe O’Brian aptly remarks that she’s just about the last friend Jack has. This season continued that trend — Jack’s former lover, Audrey, is killed by an assassin and her father, President Heller, one of the few people in the U.S. government who doesn’t view Jack as a rogue quasi-terrorist, has rapidly progressing Alzheimer’s and will soon forget all about him. After Jack hears about Audrey, he pulls out a revolver and briefly considers suicide; fortunately, he decides instead to use it to kill dozens of bad guys before beheading this year’s uber-villain. This year’s season shows that 24 still has legs. The ratings have been solid if not spectacular, and the plot line was action-packed and appropriately pushed the envelope on the plot twist believability scale without venturing into the absurdly incredible developments of past seasons, when cougars roamed the wilds of southern California and a nuclear bomb detonated over the Mojave Desert. Chloe continued to explore new technological frontiers, this year being able to turn a small satellite dish antenna into a device that could detect the heat signatures of every human on a ship, display them in a nifty color graphic, and direct Jack on where and when to shoot them. True 24 fans watch the show as much to chuckle at Chloe’s technological awesomeness as to watch Jack knock out, hoodwink, and cold-bloodedly murder scores of terrorists and henchmen. The season’s storyline ended well-positioned for another season, if the network and creative team want to do it. Jack trades himself to the Russians to free Chloe and ends up in a helicopter, bound for Moscow and the gentle ministrations of Russians who was revenge for Jack’s past actions. A new season of the show therefore could go just about anywhere. If they make it, I’ll watch it. Most people think of 24 as an action show on steroids. Poor, misguided wretches! They obviously have missed the deeper subtext of this gripping drama about Jack Bauer — which is that 24 is all about family, and the deep emotional ties that bind us together. Consider last night’s episode, for example. A mother and a daughter are enjoying a conversation in the kitchen of their London, England flat. The mother puts a kettle on the burner so that she and her daughter can enjoy some tea and conversation. What a warm, moving family scene! The mother learns some disappointing news about the daughter’s husband and decides to talk to him about it — because on 24, the families know that you need to talk about your problems and issues. Unfortunately, the husband won’t change his mind, so the mother has to order her henchmen to — lovingly — chop off one of her daughter’s fingers using a chisel and hammer. The husband then demonstrates his love for his wife and honors his elders by thoughtfully agreeing to his mother-in-law’s request. This continues a long-standing theme on 24. 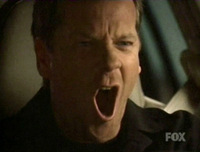 Jack Bauer has always been motivated by family, whether it’s to save his wife from peril (unfortunately, she is nevertheless murdered) or to save his daughter from peril (as she is chased by a mountain lion in the wilds of southern California, for example) or to help his errant brother return to the path of righteousness (by smothering him in a sheet of plastic and torturing him). Other characters, too, must deal with the pain of loss as their spouses and friends are gassed, poisoned, shot, and killed by rampaging terrorists. Even the President of the United States must wrestle with the family issues caused by having a wife who is exposed as a cold-blooded, homicidal maniac. Of course, some might say that 24 really isn’t about family at all, and instead just uses family characters and situations to create drama and promote mayhem. Ha! If you read the news these days, who’s to say what’s more realistic — a huggy, simpering melodrama on the Hallmark Channel, or the blood-spattered family carnage on 24? In a few short minutes, the new season of 24 will begin. We celebrated today by reviving the 24 Death Pool. When you don’t know anything about the characters you are drafting as likely future corpses, you can only fall back on tried and true 24 plotlines. It therefore is not surprising that the first three people drafted were identified as “Agent” X, Y and Z. If 24 teaches us anything, it’s that otherwise nondescript “agents” are as likely to be promptly knocked off as the red-shirted security guys on the original Star Trek. Because I drafted last, all the “agents” were gone when I made my selection — so I chose “Pete,” a member of a hacking group. I’m speculating that we know his name only because another character yells “Pete, look out!” before a bomb goes off and “Pete” is blown to kingdom come. I’m ready, baby! Bring on the deaths! When Jack Comes Back . . . . When we last saw Jack Bauer, he was walking into the sunset as a deeply moved Chloe O’Brian watched with a tender smile. 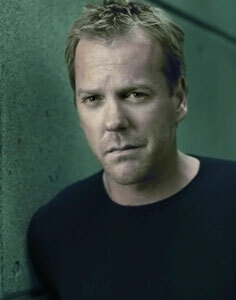 Now Fox has announced that Kiefer Sutherland as Jack Bauer and 24 will be back, for a miniseries starting next year. * Haunted by the fact that he murdered Chappelle in cold blood at the instruction of former President David Palmer, Jack has sworn off violence and become a French pastry chef. But when Tony Almeida is ruthlessly gunned down while buying a baguette at Jack’s bakery, Jack must spring into action to avenge the death of his old comrade. * Haunted by disturbing nightmares of being chased by several forever-comatose ex-presidents and Charles Logan with the arms of the Hulk, Jack has been become a fitness instructor. His clients love him for the results he achieves, even though he motivates them to exercise through random acts of torture. But when his loyal client, the National Security Advisor who happens to be David Palmer’s half-sister, is seized by French terrorists seeking to restore the Holy Roman Empire, Jack must once again shoulder the Jack Pack to battle the forces of evil. * Haunted by the fact that he failed to detect the presence of countless moles at CTU, Jack has become a real-life mole exterminator. But when his excavations to knock off the furry critters infesting a large California estate uncovers nuclear devices, fatal gas canisters, and biomedical weapons planted at the estate in advance of a presidential fundraising visit, Jack is sucked into a high-energy race against time to foil the plotting of former President turned terrorist Allison Taylor. * Haunted by the fact that he never answered the call of nature or ate any food for days at a time, Jack has spent the last two years in the bathroom eating fried chicken and whispering inaudibly. But when a sobbing President Chloe O’Brian calls to tell Jack that her two children have been kidnapped by her ersatz nanny, in reality an agent of the North Korean government, Jack must set down the drumstick to help his old friend and fend off an invasion led by his estranged daughter, who has been brainwashed by the North Korean state.